"The Careers Hub at City University is great at enabling involvement with numerous outreach programmes to promote higher educatation in local schools"
The numerous opportunities I have been exposed to. The Careers Hub at the Institution is really good for casual paid work. I have been involved with numerous outreach programmes to promote higher education in secondary schools. At the moment I am tutoring Mathematics to my own small class at the City of London Academy which the university has organised for me – it is a very different experience. My course is career orientated as the title suggests. I would very much like to go into dosimetry – they are responsible for planning the radiotherapy treatment for patients using CT scans and a software called Aria. Patient contact is definitely great, each person is different and over the course of their treatment you get to know them better. However, as indicated above, I have very recently become fascinated by the dosimetry and planning side. I was not as aware of it as I am now, but the course is very demanding. 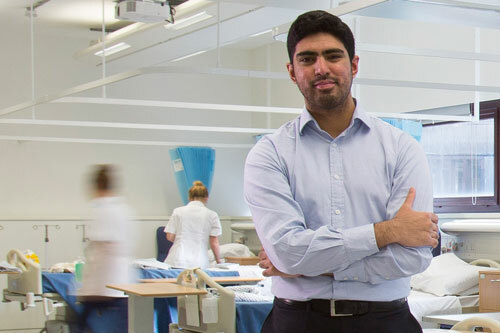 You will be sent to clinical placement blocks that will have the normal working hours from 9am-5pm, five days a week; when you come home you will then have to study if you want to keep up with the workload. Your year will also start earlier and finish later compared to other courses. In order to get through it, organisation and resilience is key. The Institution lecturers do visit us once a week while we are at placement to check if things are running smoothly. I find this offers me a much needed reprieve. Tutorial sessions offered during exam time are likewise quite helpful. Unfortunately at the moment I am still unsure, I may choose to ultimately become a lecturer, but I am still considering my options.